Good Feeling is a Kirie 326 from 1994. 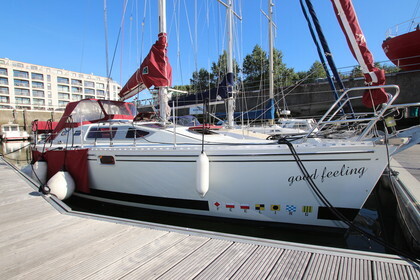 It has brand new sails from Elvstrom Sails, New Garmin automatic pilot, new Garmin plotter and Dephtfinder. In the back there is a custom made bench so skipper can sit conforteble when sailing. All the covers and bimini are in bordeaux red which gives this sailing boat an unique character. Inside it's very comfy. You can sleep with 6 people onboard. The cruising speed of the boat is 5,5 knp and consumption is 3l/h. The boat comes with a dinghy and Honda air cooled 2 hp engine. Contact me for a visit.